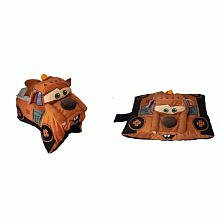 The Disney Pixar Cars 2 Tow Mater Pillowtime Play Pal is a fun and cozy companion at bedtime. Featuring the image of the much-loved Tow Mater, this pillowtime pal is sure to grab and hold your child’s attention. This play pal also folds easily to become a comfortable bedding pillow for your little one after a long day of play. Pull to open and cuddle – Close to have fun and play!